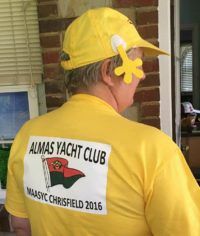 With summer around the corner the Almas Shrine Yacht Club is looking forward to a mixed bag of cruises, picnics, and the Mid Atlantic Association of Shrine Yacht Clubs Annual Rendezvous in Chris eld, Maryland. This year our Mid-summer cruise will be via land yachts to the home of Past Commodore Don and First Mate Becky Holliday for a potluck and cookout on August 20th. The club will supply grillings, chips, sodas, and beer. Members are to bring their favorite picnic sup- port dish. The nal cruise of the year will be October 15 via land yachts to Pirate’s Cove restaurant in Galesville, Maryland. Information on these events will be communicated via e-mail and on the club’s Facebook pages. 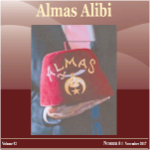 The Almas Yacht Club will be entering a oat in the MASA convention in September. If you are interested in helping with the oat contact Commodore Frank ( reton@mac. com) for information and follow us on Facebook. First Mate Steph and I have several cruises planned for the summer including the MAASYC Rendezvous. One of our favorite destinations is St. Michaels and the Chesapeake Bay Maritime Museum. The Museum is one of the premier museums on the Atlantic seaboard and well worth a visit as is the town of St. Michaels. The museum is a working museum and, in addition to exhibits, it hosts events, ship restorations, and offers rides on historic boats. The latest restoration project is the Bugeye Edna Lockwood, a two-mast, nine-log bottom oyster boat. When the mast was removed dur- ing restoration a 1889 silver dollar was found embedded in the mast step. Embedding coins in the mast step is a maritime tradition thought to have begun by the Greeks and Romans who embedded coins to pay Charon fees to ferry sailors killed in battle across the river Styx. Now it is for the less gory purpose of good luck and continues on Navy vessels with coins or plaques attached to masts. Check out the museum’s website at www.cbmm.org for information on the restoration project and visiting hours. Also, check out Edna’s website http://www.ednalockwood.org to follow the restoration project. Frank Ireton, Commodore, Almas Yacht Club.